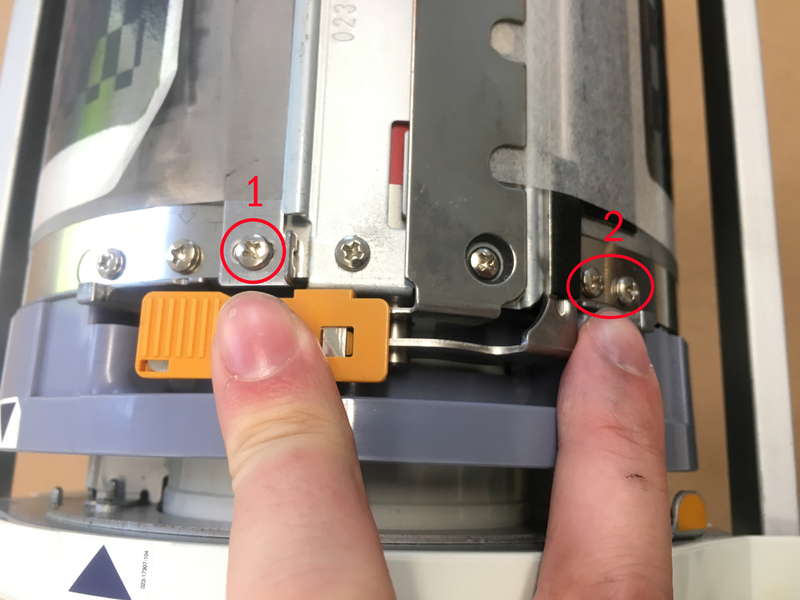 Remove the two end hanger screws (#1 in photo, the second screw is on the opposite side of the drum). Remove the four top hanger screws (#2 in photo, the third and fourth screws are on the opposite side of the drum). With one hand on the top of the screen assembly, rotate drum and lift the screen off of the drum body. Lay the screen down on parchment paper and set to the side. Remove the four screws on the clamp plate base assembly. 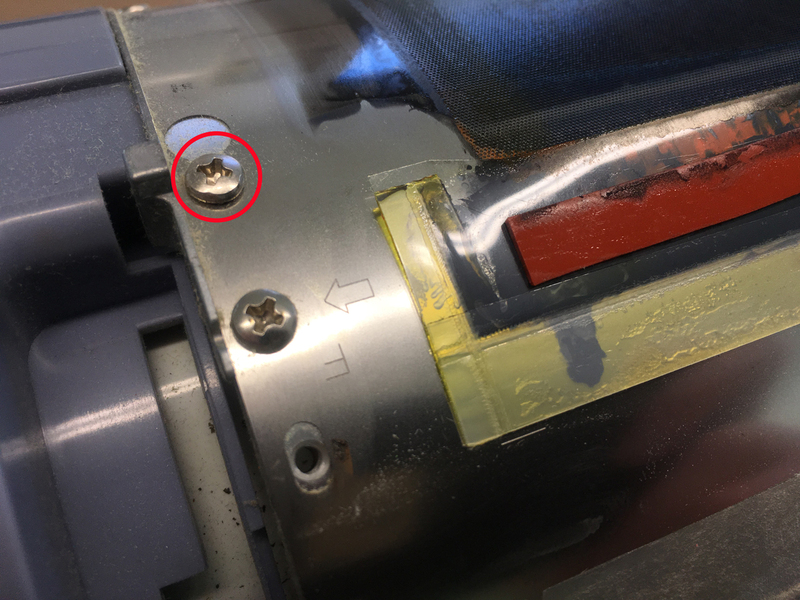 Loosen the two mounting screws in the keyhole-shaped holes at the front and rear side of the print drum body. Remove the remaining eight mounting screws on the print drum body. With one hand holding the print drum body in place, remove the tape from the drum. Carefully pull the print drum body up. Remove the remaining two screws holding it in place. Set the print drum body aside on a sheet of parchment paper. Detach the two connectors from the pump assembly. Unscrew the four mounting screws and remove the front frame cover. Set to the side. Remove the four mounting screws from the two side rails and set them off to the side. Slide the rear frame assembly off and set off to the side. Remove the three mounting screws and slide the print drum joint off and set to the side. Use the c-ring removal tool to remove the c-ring. Remove the four mounting screws and remove the ink distributor. Set off to the side. In preparation for cleaning, tape the wire harness to the side of the drum frame. Lift the rear of the drum and set onto the lifting blocks. To start use a piece of cardstock (or similar) to squeegee off as much ink as you can from the rollers. Once major globs of ink have been removed, go through with paper towels and q-tips soaked in denatured alcohol and clean everything you can get to. The more thorough the cleaning job the better the outcome. Note: It is possible to remove the roller sub-assembly but for the purpose of cleaning to change colors I don’t think this is a necessary step. A tutorial on removing and adjusting the roller sub assembly will come in the future but it is a very labor intensive process. The drum can be flipped for cleaning. You can remove these two side gears to clean more thoroughly. If you do, note the side of the small pinion gear. It is one directional, so if you put it back wrong side first, you will damage your drum. Once the rollers are clean, use your dust remover spray to get rid of any paper/dust particles that have built up inside of the drum. Thoroughly clean the rear flange and slide it back into place. Reattach the c-ring. Remount the print drum joint with the three corresponding mounting screws. Using a turkey baster or a lab squirt bottle, flush out the ink with denatured alcohol. Use q-tips to clean around the entry hole. Alternate method: start by letting the ink distributor soak overnight to help loosen the ink up. Using the anti-static wipes and anti-static wrist band, remove the ink from the two sensor points. Carefully remount the ink sensor back into the print drum (2 screws). Clean off any ink that may have gotten on the ink cartridge guide assembly. Remount into the drum (4 screws). Untape the wire harness and reconnect the two connectors. First, remove the two screws on the black adaptor nozzle. Clean the unit. Second, remove the four plate screws to get inside of the ink pump assembly. Clean out the ink with q-tips. Reassemble unit and mount back in drum (2 screws). Reconnect the two connectors. Thoroughly clean and remount the two scraper plates (1 screw each). Note: they are marked with front and rear. Using the microfiber rag and alcohol, thoroughly clean both sides of the print drum body. Be sure to remove all original tape residue. Use the parchment paper underneath it to help keep ink and alcohol off of your surfaces. Work your way down the drum on either side and loosely put the remaining screws into the holes (6 screws). DO NOT FULLY TIGHTEN SCREWS YET. Tighten the ten screws and add in two additional screws noted in the photo. Use the screws from the screen assembly to temporarily hold the print drum body down for taping. Once those two screws are tight, remove the screen springs. Thoroughly wipe the surface of the print drum body with a microfiber cloth and alcohol. Remove any grease/fingerprints/residue. Using the screen tape, run a 1-inch strip to tape down the seam of the print drum body. Once taped, the two temporary screws can be removed. Lay down the parchment paper, put the screen on it. Using the microfiber cloth and alcohol, wipe and clean the screen as best as you can. Once clean, slide the screen under the drum, up and over. Tighten the four mounting screws on the top hanger. Wrap the other end of the screen up on the other side. Using the screen springs, tension the screen to the drum from the two metal nubs shown earlier. Before setting the two screws and tightening, inspect the screen all the way around to make sure it’s wrapping evenly and there are no wrinkles in the screen. With two fingers on the front position and rear position adjustment buttons, hold them down and turn on the machine to put it into test mode. Put in the freshly cleaned drum with the desired ink tube. There may be an error message that comes up, clear it by pressing stop. Enter code: 117 and hit start. Once it finishes the action, hit stop and enter code: 890 and hit start. Once it finishes the action hit stop, the new color will be programmed into the drum. At this point, turn off the machine and turn it back on again in test mode. Enter code: 887 and hit start. This will re-ink the drum with the new color. This process may take a minute or two. Once it’s done, make a test master by entering code: 80 and press start. Once the test master is wrapped on the drum, hold down the reset button to put the machine back into normal mode. Run about 50 prints to get the ink working its way through the drum and to make sure everything is printing correctly. If you're going from a dark color to a much lighter color you may have to run a few more prints to make sure you clear out any previous ink residue. That's it! Enjoy your freshly cleaned drum and your new Riso color.